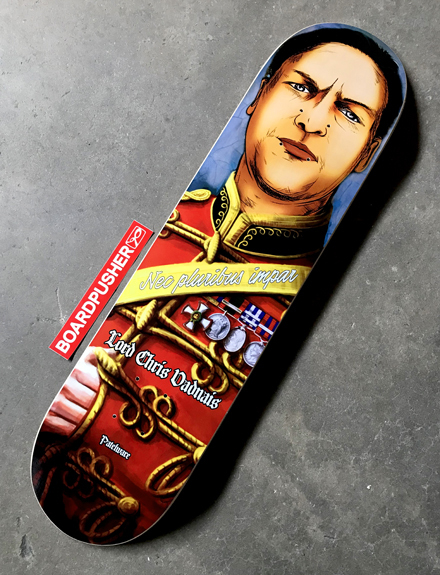 Chris Vadnais decided to explore his lineage with today’s BoardPusher.com Featured Deck. “This design features my namesake ancestor, Lord Chris Vadnais, who was a personal friend and confidant to Ludwig II, King of Bavaria from 1864 – 1886. The inscription, ‘Nec pluribus impar’ is a Latin motto King Ludwig stole from Louis XIV of France. Historian Henri Martin called the motto ‘very pompous and, above all, obscure and perplexing.’ It translates to ‘Not unequal to many’ — sort of a double negative.” You can follow Chris on Instagram @cvad. Upload the faces of your family and friends on a custom skateboard graphic at BoardPusher.com.